Nuts provide a number of benefits for people with diabetes. Studies suggest that nuts may even decrease the risk of type 2 diabetes. A study published in the Journal of the American College of Nutrition found that "nut consumption was associated with a decreased prevalence of selected risk factors for cardiovascular disease, type 2 diabetes, and metabolic syndrome. 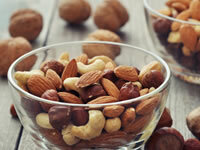 This page explores the various benefits of nuts for people with type 2 diabetes. Do different nuts have different health benefits for people with diabetes? Yes. Some nuts have benefits that others don't. Almost all nuts offer something good for people with diabetes. Salted nuts, however, should be avoided. Excessive salt consumption is consistently linked to an increased risk of heart disease. One of the most prominent characteristics of nuts for people with diabetes is their effect on cholesterol levels. Avoiding high cholesterol levels is essential for people with diabetes, because exposure to high blood glucose levels increases the risk of the arteries narrowing. Almonds, peanuts, and pistachios all reduce "bad" cholesterol very effectively. "Bad" cholesterol refers to small, dense particles of low-density lipoprotein (LDL), too much of which can clog the arteries. Almonds, walnuts, pistachios, pecans, and hazelnuts reduce "bad" cholesterol by increasing levels of high-density-lipoprotein (HDL), or 'good' cholesterol. HDL clears out 'bad' cholesterol, thus reducing the risk of heart disease. The glycemic index measures the speed at which your body absorbs carbohydrates. All foods are ranked on the glycemic index. Nuts are low on the glycemic index, which means your body absorbs the carbohydrates slowly. In 2007, a study in Metabolism found that adding almonds to white bread and eating nuts with pasta slowed the rate of carbohydrate absorption (although that doesn't mean eating white bread is a good idea - you can get the same benefits from having whole grain bread, without the effect on blood glucose levels). As a result, the participants' blood sugar levels rose much more slowly. People with diabetes have a significantly increased likelihood of developing heart disease. As many as 80 per cent of people with diabetes will die from a heart-related health problem, it is predicted. Many nuts have a positive effect on heart health, reducing the risk of cardiovascular health problems and making them a great option for people with diabetes. Almonds and walnuts, which contain a lot of vitamin E, also inhibit the development of plaque that can narrow and clog the arteries. Walnuts also have a lot of Omega-3 fatty acids, which is a kind of unsaturated fat most commonly found in fish. Omega-3 fatty acids increase levels of "good" cholesterol. Many nuts contain an amino acid known as L-arginine, which strengthens the walls of the artery and makes them more flexible. People with strong, flexible arteries are less likely to suffer from poor blood flow. How many calories are in nuts? 100g of almonds contains 576 calories, which is a lot for people with diabetes. It is therefore recommended that people with type 2 diabetes who would like to lose weight limit their consumption of nuts somewhat. On the whole, are nuts good for people with diabetes? Yes, but the effects vary depending on the kind of nut. Most of them offer some kind of benefit, from cardiovascular health to Omega-3 oils. The best advice, then, is to incorporate a generous amount of nuts into your diet, and make sure you get a variety. The most important nuts for people with diabetes are probably the ones that improve cardiovascular health: almonds, walnuts, and pistachios, namely. If you only incorporate a few nuts into your diet, choose these ones. But be sure to avoid the salted varieties.